The tasks in this extension allow for running terraform cli commands from both the Build and Release pipelines in Azure DevOps. The motivation for this extension was to provide terraform pipeline tasks that could execute on all build agent operating systems and provide contextual/guided task configuration. The tasks can execute on all supported build agent operating systems including Ubuntu and MacOS. The task definition will adjust to the selected command to prompt for what is relevant to the command. For example, validate does not require knowledge of the backend configuration so this section will not be used when executing validate. The validate command does accept vars file however. Therefore, the field to specify vars file will be available. When executing plan, apply, and destroy commands, the task will prompt for the target azure subscription to use. 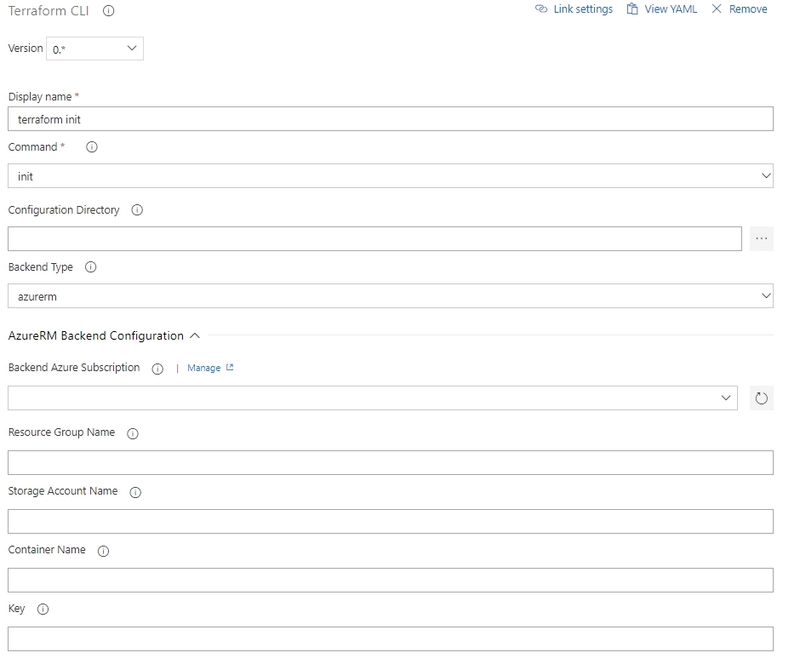 This is specified as a service connection/principal for deploying azure resources. local (default for terraform) - State is stored on the agent file system. azurerm - State is stored in a blob container within a specified Azure Storage Account. The backend configuration will be prompted when relevant for the selected command. 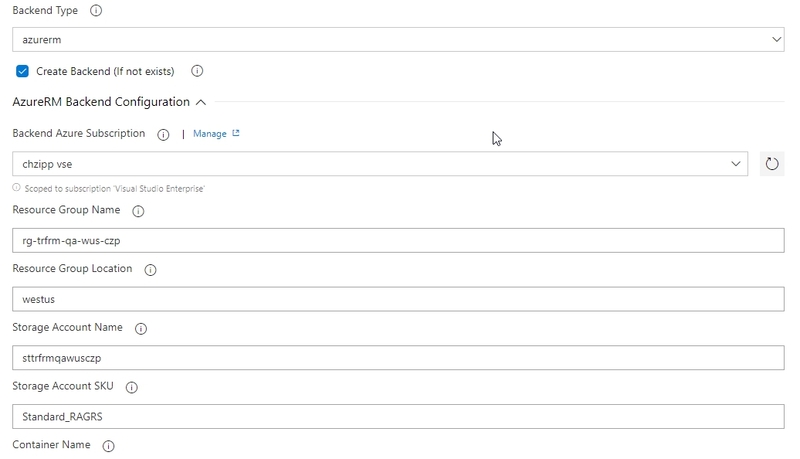 If azurerm selected, the task will prompt for a service connection and storage account details to use for the backend. The task supports automatically creating the resource group, storage account, and container for remote azurerm backend. To enable this, select the task for the terraform init command. Check the checkbox labled "Create Backend (If not exists)" underneath the backend type drop down. Once selected, the resource group location and storage account sku can be provided. The defaults are 'eastus' and 'Standard_RAGRS' respectively. The task will utilize AzureCLI to create the resource group, storage account, and container as specified in the backend configuration. There are two methods to provide secrets within the vars provided to terraform commands. First, if providing individual -var options to the command line, the secret pipeline variables can be used. Use the Command Options field to input your secret vars as -var 'secret=$(mySecretPipelineVar). 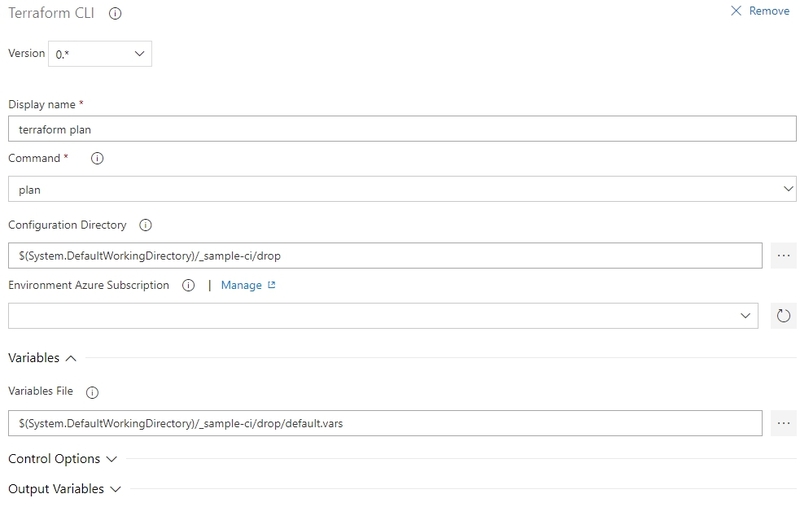 Secondly, a var file secured in Secure Files Library of Azure DevOps pipeline can be specified via drop-down menu. Storing sensitive var files in the Secure Files Library not only provides encryption at rest, it also allows the files to have different access control applied than that of the Source Repository and Build/Release Pipelines.